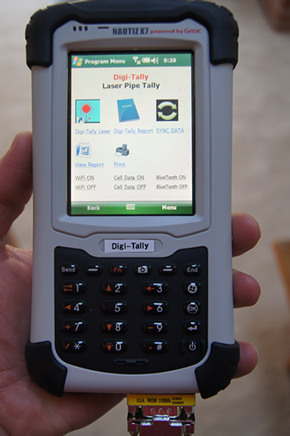 The Laser Pipe Tally System by Digi-Tally, Inc. provides a complete battery operated mobile field pipe tally system for use at the job site, in pipe yards, or in manufacturing facilities. 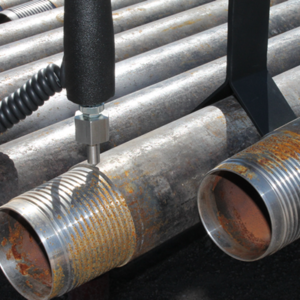 The length of each pipe joint is measured using an advanced class II eye safe laser and the data is processed on a mobile field controller. 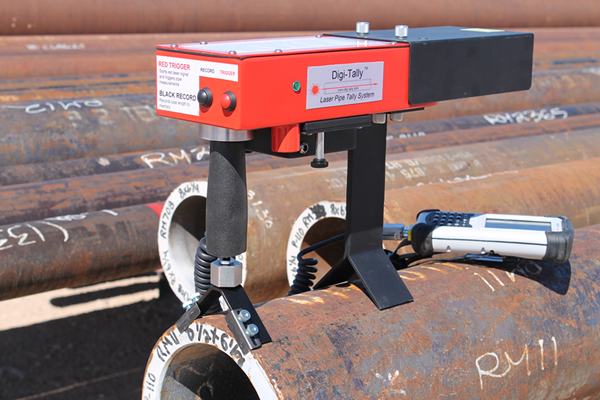 The Digi-Tally unit rests on the pipe with a rugged alignment support and is equipped either with our unique top thread locator (patented) for “threads-off” joint tallies or our pipe end locator for “threads on” tallies. The visible red laser spot is bright and visible on the target at laser5the far end of the pipe. The mobile field controller can be hand held, supported by a belt retractor or mounted to the laser unit. Perform the tally, then automatically create a complete text based report than be printed, viewed, and saved electronically for future reference. Pipe tally measurements are clearly displayed on the touch screen field controller. Operators have the ability to confirm the reading before recording the value to the current pipe tally. The special orange target plate permits the laser spot more visible and provides a stable means of detecting the end of the joint. In the event that an operator error is made, authorized users can manually edit a measurement or acquire a new measurement via the laser system. This can be entered manually or taken using the laser. Job information is entered by the operator and recorded with the tally data. This information will appear on a report when created. The Digi-Tally Report application incorporates an auto-check routine and alerts the user of any anomalies in joint length. The bar plot of joints also provides a visual indication of length irregularities prior to generating the report. The overall report can be provided in both printed and electronic format. The file can be printed on-site with the optional mobile Bluetooth enabled printer, saved to a USB flash drive, or transferred to a PC via USB or our cloud based wireless solution. This file can be opened in most text editors and spreadsheet applications. A complete listing of all jobs appears on the controller. You can sort these jobs via several parameters, such as date or customer. Select the job you need to create a report for by simply clicking the radio button to the left. It is also possible to edit a job’s tally data in case an error was made during the tally. Users have the option of exporting the tally data after a tally session has been completed or creating a summarized report. If you would like to manipulate your own tally data or import this data into an external inventory management system, Digi-Tally provides you with capability to export the tally data as a tab delimited text based file.